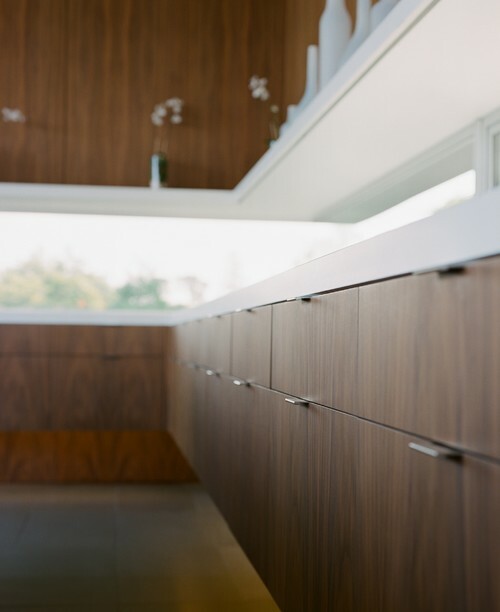 Houzz Contributor Jennifer Ott recently shared with us some ways to design our kitchen cabinet space with comfort in mind. We liked the advice so much we wanted to share it with our readers. So here goes! Those of you building or renovating a kitchen face countless decisions. 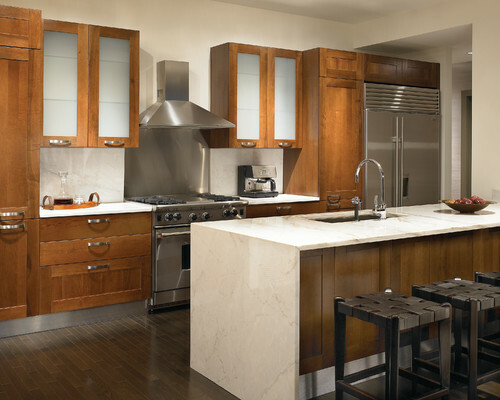 Just for the cabinetry, you have to select the material, frame type, door style, hardware and more. 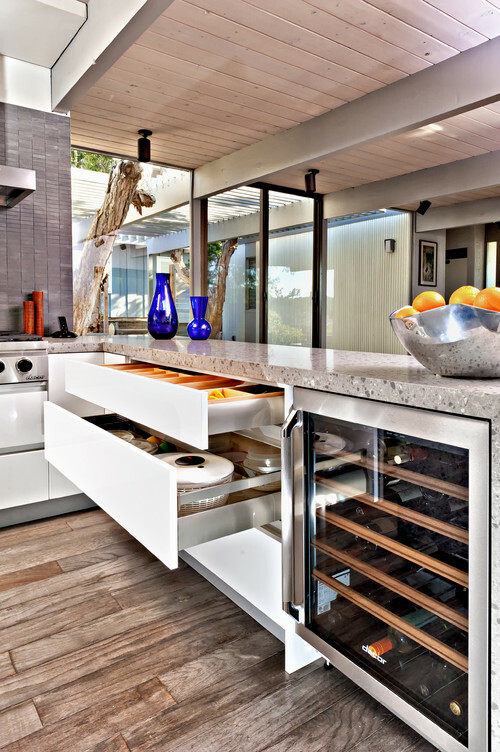 I hate to add to your list of selections to make, but there are a few details to think about when it comes to ergonomics, too; how you configure your cabinetry can make your kitchen a comfortable and efficient workspace for you and your family. Wall cabinets can be a stretch for many to access – or altogether out of reach for some – so consider removing wall cabinets and putting in a bank of windows instead. This is an especially smart move if doing this will give you a nice view. Instead of wall cabinets, I like to install shallow floor-to-ceiling pantries. They’re an efficient use of an interior wall, where you can’t have a window anyway. By limiting the depth to just 6 to 9 inches, you are forced to line up your dry goods in a single row, making everything easier to find. 3. Go for open shelves. If you really need wall-mounted storage, try installing a few open shelves. They’re a more efficient way to store items because you (and your guests) can see where everything is, and you don’t have to open and close cabinet doors to access things. Limit the stored items to those you use often so they are less likely to collect dust. 4. Lift up, not out. 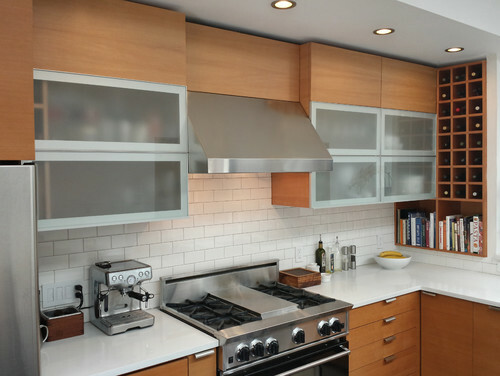 For those who want closed wall cabinet storage, take a look at horizontal cabinets. There’s only one door you need to open to see everything in the cabinet, and you don’t have to step out of the way as you open and close it. 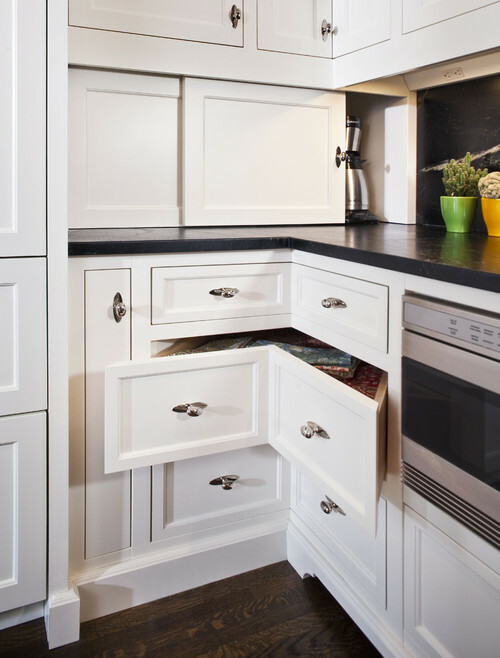 When it comes to base cabinets, I can’t recommend drawers over doors strongly enough. Deep drawers can hold almost anything you need to store in a base cabinet. Plus, it’s much more efficient to just pull the drawer out and have all the contents on view right in front of you than having to open two doors and root around for what you need. 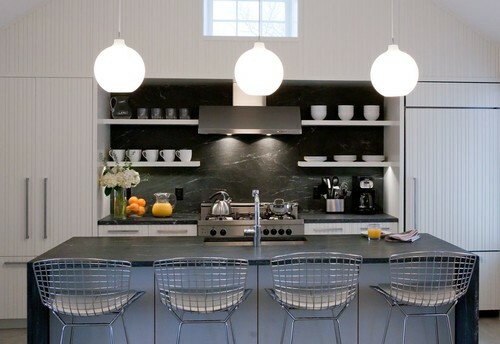 If you can design your kitchen to not have corner cabinets, do so. 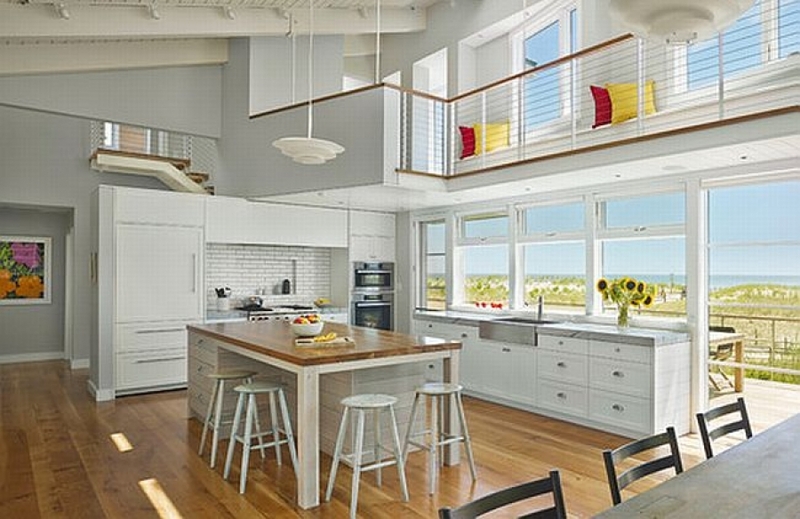 Corners tend to cause traffic jams in kitchens, and corner cabinets can be awkward to use. 7. Or make the best of your corners. 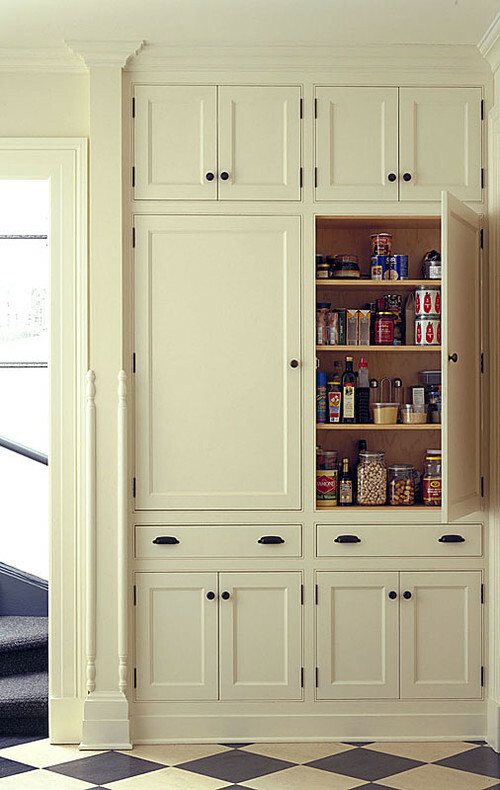 If you can’t avoid corner cabinets, then at least make them as functional and easy to use as possible with fully rotating lazy Susans or clever corner drawers. Soft-close door hinges and drawer glides are more must-haves. It is totally worth the small extra charge for these features, which allow you to shut doors and drawers with one efficient push and no slamming. 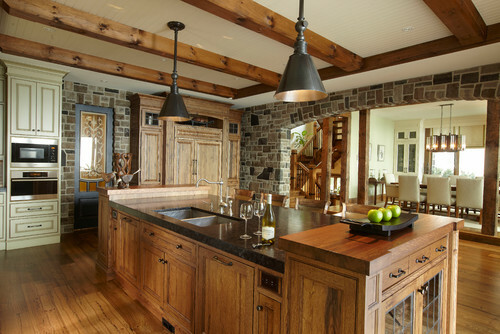 While the standard kitchen countertop height is 36 inches, there are many tasks that are more comfortably performed on a lower or higher surface. This is especially true for those who are taller or shorter than average. Typically you want your forearms to be at or near level when you’re working at the countertop. But for us tall folks, that’d require a surface height of 42 inches or more — a difficult height for kids or shorter members of the household to use. The solution is to set up areas with differing countertop heights to accommodate the various statures of the users and their tasks. Extra storage room in the cabinet underneath is an additional upside to taller work surfaces.